We supply complete set of disposable Cutlery in 100% Biodegradable plastics ! plastic cutlery like spoons, ice cream spoons, forks, and knifes etc. In various sizes is specially designed for fast food chains, restaurants motels & parties. These are made from food grade plastic & extreme care is taken that no sharp edges are left. 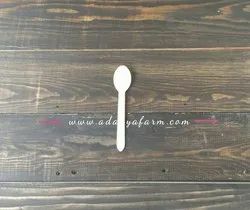 Banking on the skills of our qualified team of professionals, we are instrumental in offering supreme quality range of Disposable Wooden Spoon. The consumables range of products includes disposable cutlery items for use in airlines and take aways. Today's discriminating consumers are searching for this upscale alternative to provide the ultimate in convenience for all of their special occasion needs. We have been among the first and the best in creating beautiful, high quality, cost-effective serving ware for the catering industry. Areca leaf plates and Areca Cutlery can be used in any occasion like parties and picnics. It does not contain any chemicals or toxic materials in it and is completely human friendly. It can be used after being stored for a long time also. 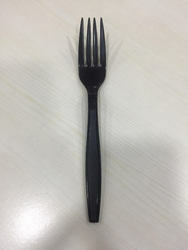 With the help of our professionals, we are able to offer a wide variety of Disposable Plastic Fork to the clients. All our forks are manufactured using polystyrene along with advanced machines as per industry set quality norms. The offered products are widely used in varied organizations as a part of their disposable cutlery. Best provider of Eco Friendly Disposable Cutleries. Offering a wide range of Areca Leaf Fork are made from naturally fallen leaves of Palm Tree (Areca) Earth Friendly / Renewable / Sustainable / 100% Natural. In line with clients' diverse requirements, we are involved in providing an optimum quality range of Disposable Plastic Fork. The spoon made in areca leaf is one of the first kind of creative design by the magnus. We are proud to be the only manufacturer making spoons in areca leaf products. These soup spoons are perfect with the soup bowls which is also made up of areca leaf.